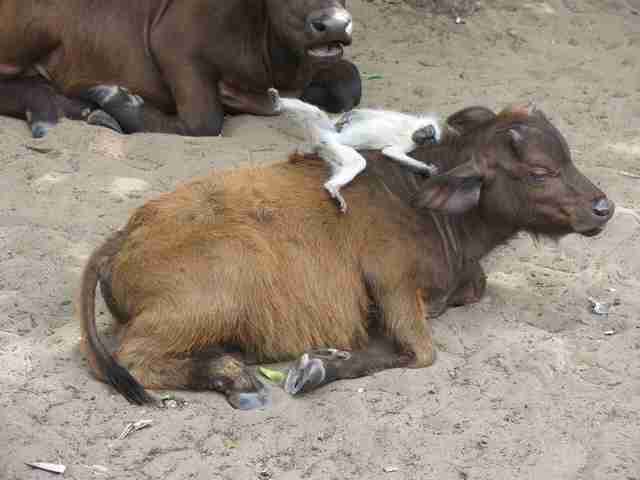 It’s a sweet scene right out of a storybook: A fuzzy white monkey playfully climbs over the backs and heads of two patient buffalo calves, snuggling into their necks and even grooming behind their ears with his tiny hands. 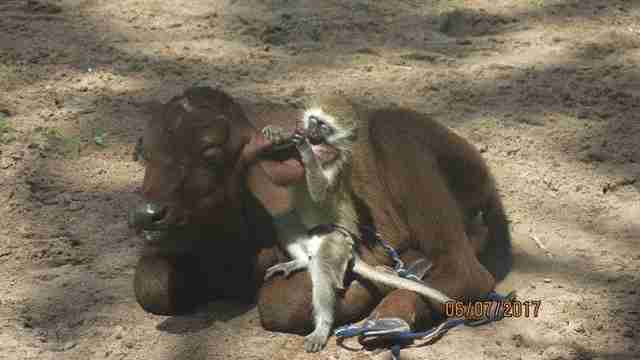 Orphaned after his mother died, Zumzum, a baby vervet monkey, didn’t take long to befriend the calves — and being orphans themselves, the young buffalos, who were saved from drought and bushmeat poachers, have welcomed the small primate as one of their own. The unlikely trio are being hand-raised and rehabilitated at the Lamu Conservation Trust (LCT), a conservation initiative in Kenya supported by The David Sheldrick Wildlife Trust (DSWT). Zumzum was rescued in May from an illegal exotic pet breeder in the town of Lamu, Kenya, not far from the sanctuary. While he is now enjoying life at LCT, the small monkey is just one example of countless animals forced into the multibillion-dollar exotic pet industry each year. According to the Humane Society of the United States, the trade generates $15 billion in revenue in the U.S. alone and is second only to drug and weapon trade worldwide in profits. Most animals are sold over the internet, at auction or in trade magazines with little regard to their end destination. Some end up in the care of private citizens who keep them at home as pets, while others are kept in subpar zoos or roadside exhibits for human entertainment. The captured animals often endure grueling transport conditions in trucks, boxes or even luggage to exporters or breeding facilities; many die before they ever reach their destination. The breeding, selling and transporting of exotic wildlife is technically legal on a federal level despite the fact that many of the animals being bred and sold within the U.S. arrive here illegally, according to Born Free USA. 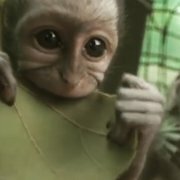 “Because the chances of getting caught are so slim and the financial gains are so huge, exotic animal traffickers and breeders gladly take the risks associated with breaking the law — especially since the penalties exacted are little more than a monetary fine or, in extreme cases, a short jail stay,” Born Free USA reports. As in Zumzum’s case, many infant animals are also plucked directly from their native habitats each year to be sold within the trade — a problem that is especially prevalent in countries like Kenya, where the diverse wildlife is threatened and poaching is a national issue. Since infant animals are typically highest in demand, it’s not uncommon for poachers to kill the protective mothers first to make it easier to capture their young, Alden said. Naturally very social animals who can live in troops of up to 120 in the wild — though their troop size is often lower due to habitat loss — vervets in captivity are prone to developing severe psychological problems due to lack of natural environment and family structure, David Du Toit, director of the Vervet Monkey Foundation in South Africa, told The Dodo. When they are raised from infancy by humans instead of their primate families, they may seem agreeable — but as they age, they can grow aggressive and territorial from natural instinct and a lack of socialization, he said. 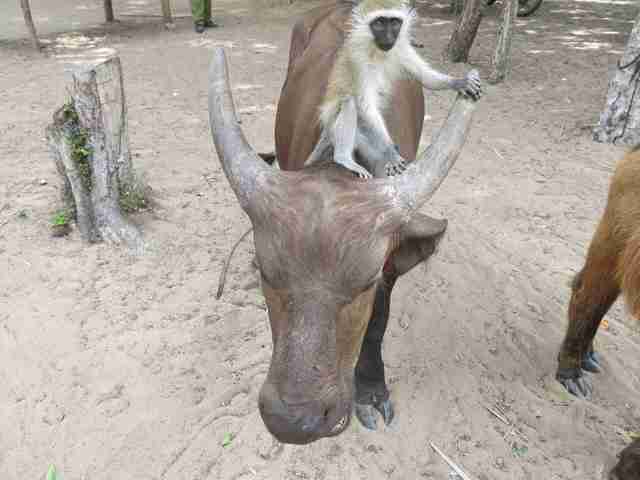 While Zumzum is still too young to be introduced back into a wild vervet society, rescuers see his palpable bond with the two young buffalos as a hopeful sign that he’ll one day be ready. 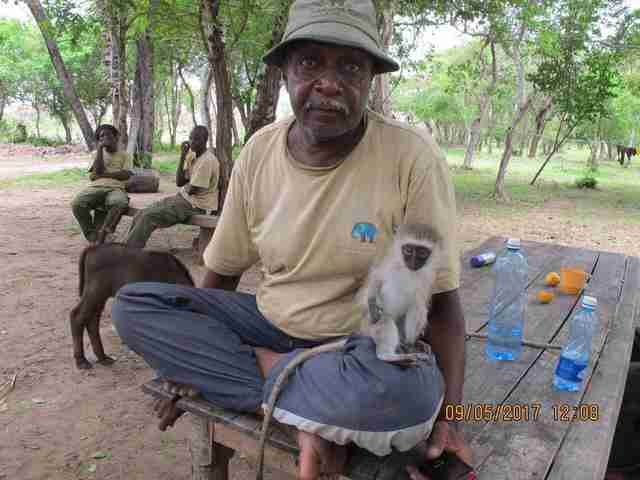 And despite some challenges that he may face before then, such as finding a vervet troop he can gradually be accepted into, he’s already made promising strides. To learn more about the work of the Lamu Conservation Trust and stay up to date with the rehabilitation of Zumzum and his buffalo friends, visit the organization’s website and like its page on Facebook. You can also donate to help support Zumzum and his friends.